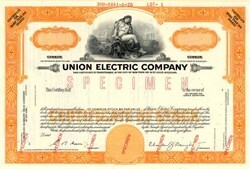 Beautiful engraved specimen certificate from the Union Electric Company dated in 1970. This historic document was printed by American Bank Note Company and has an ornate border around it with a vignette of an allegorical woman. This item has the signatures of the Company's President and Secretary and is over 36 years old. Union Electric founded in 1902, operates as Ameren and serves 1.2 million power customers and 110,000 gas customers through nine power plants. The utility's service territory includes 65 Missouri counties and four Illinois counties; more than half of its customers reside in the St. Louis metropolitan area. AmerenUE also has interests in power plants (primarily thermal) with approximately 8,000 MW of generating capacity, and it engages in wholesale power transactions. 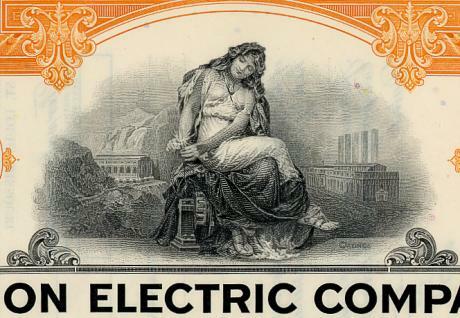 In December 1997, Union Electric and CIPSCO Incorporated, parent of Central Illinois Public Service Company, merged, creating Ameren Corporation and its principal operating companies � AmerenUE and AmerenCIPS. Ameren, its operating companies and its subsidiaries serve over 2.3 million electric and 900,000 natural gas customers in Missouri and Illinois.